"Outside the harbour of the country, neither very near it nor very far from it, there is a small well-wooded isle . . . it remains unploughed and unsown perpetually, empty of men, only a home for bleating goats. For the Kyklopes possess no ships; they build no vessels to serve their needs, to visit foreign towns and townsfolk as men elsewhere do in their voyages." Dorothea Bate was born in Carmarthen in South Wales in 1878, the second of three children in a family of a rural countryside. Her father encouraged her interest in the collection of natural artefacts and she absolved the regular school, but despite their enthusiasm there was not the possibility of higher education. In 1898, at age 19 the family of Dorothea moved to Gloucestershire, a region with many caves in the surrounding limestone formation. At this time in Dorothea emerged also an interest in palaeontology. Fig. 1. 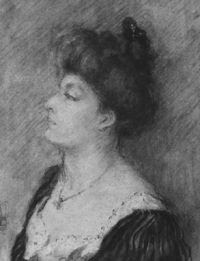 Dorothea Bate, drawing by her sister Leila Luddington probably in 1906. It was probably painted during the 5 years when her parents refused to allow her to travel abroad, from SHINDLER 2007. Dorothea decided to approach the British Museum in London and to ask for a job. Surprised by such ardour she was taken to the curator of the collection of birds. Dr. Richard Bowdler Sharpe was at first not too enthusiastic of this decision, not only he mistrusted the young women, but especially women were not employed at all by the British Museum. But her knowledge of bird taxonomy soon impressed him and doubts vanished. In one of the caves of Gloucestershire she discovered, during a private excursion and helped by local miners, cave deposits with a large quantity of small bones. She extracted the bones from the sediments and contacted the vertebrate palaeontologist at the British Museum. The fossils of small rodents from the last ice age discovered in "Merlin's Cave" was considered so exceptional that she was encouraged to publish her research "A short account of a bone cave in the Carboniferous limestone of the Wye Valley" (1901) in the prestigious Geological Magazine. In the same year another exceptional occasion arose, she was invited to pass some time by friends on the British controlled island of Cyprus, in 1904 she visited also Crete. Despite fossils were already known to occur on these islands, little was known about the animals these remains represent. In 1528 the Italian astronomer and cartographer Benedetto Bordone mentions in his "Isolario", a book describing all the islands and their peculiarities known at the time, entire mountains made of bones of animals and humans. In his "Chronicle of Cyprus", written previously of 1555 by the Cypriot historian Leontios Machairas, he mentions petrified bones, supposedly from ancient catholic martyr. Cuvier described in 1804 and 1824 various fossil hippopotami, one species was a pigmy hippopotamus named Phanourios minor, thought to come from French deposits it was later recognized to be identical to "pig" material send from Cyprus by Dorothea Bates to Charles Forsyth Major at the museum of Paris. In the second half of the 19th century various expeditions were financed to collect fossils on the various islands of the Mediterranean Sea. Apart these information's, the fossil sites described by previous researchers were still difficult to reach in the early 20th century - there were for example no harbours for larger ships in Cyprus, streets were rare and much rarer were accommodations for the few tourists venturing inland. But Dorothea was not afraid of obstacles; walking, riding and swimming she visited various previously described caves and managed to discover new fossil bearing caves with a rich fossil fauna: various strange endemic species, bones of elephants, various deer (in 1904 Bate will also discover in a cave on Crete the fossil bones of an endemic Cretan deer Candiacervus) and rodents (Mus minotaurus, also from Crete). Most intriguing were species resembling animals of the mainland, but significantly different in their size - like dwarf elephants new to science - Elephas cypriotes and Elephas creticus - or the dwarf Hippopotamus minutus and a extinct dormouse Hypnomys morpheus much larger than the specimen previously known. Dorothea recognized this trait of size differentiation was peculiar to island faunas and that it had affected various, very different groups of mammals. Dorothea returned to England, where she, not entirely voluntarily, stayed for the next 5 years, as unmarried daughter she had to keep company to her parents. After this time-out she travelled to the Balearic Islands and continued her research on island faunas. 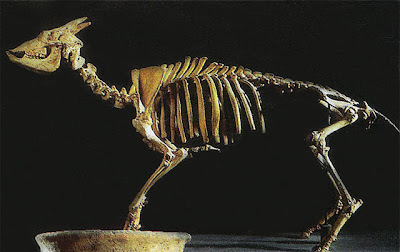 Here she discovered and described in 1909 one of the strangest fossil mammals ever to be found - the "mouse goat" Myotragus balearicus (also referred as rat-like goat, cave goat or antelope-gazelle, emphasizing his strange morphology). Fig.2. 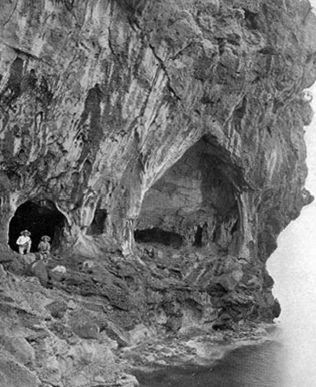 Dorothea Bate's photograph of the "Coves dels Coloms" in northeast Majorca, one of the cave sites where she discovered fossil remains of Myotragus, from SHINDLER 2007. Fig.3. Skeleton of Myotragus balearicus. 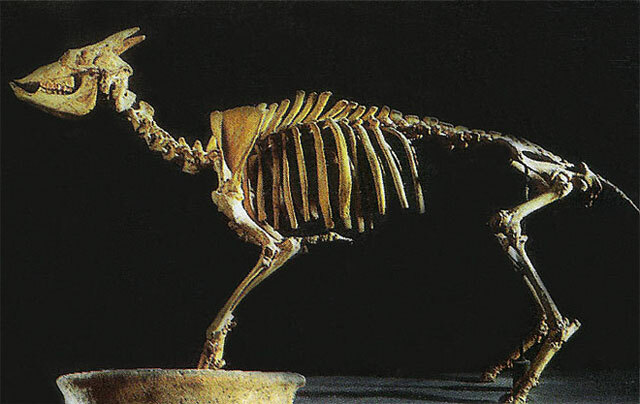 Myotragus was a bulky animal, with legs situated wide apart, the eyes were directed more to the front, not as usual in artiodactyls to the side - probably all adoptions to better climb steep cliffs and jump distances. But the most peculiar characteristic were just two, enormously enlarged and continuously growing rat-like incisors in the lower jaw. Despite her scientific success, between 1903 and 1914 she published 15 papers dealing with insular faunas, she had to finance her entire research for most time privately and money was always a problem - she couldn't also become a scientific staff member of the museum, as this was forbidden for women until 1928. Only in 1948, with 70 years, she was given official employment and managerial responsibility of the Natural History Museum at Tring (50km from London). She died on 13, January 1951, working until just before her death. This is fantastic. I sure would like to see it in GSA Today. I sent you an e-mail regarding submission. Please, correct the name "cuevas de los colombs", the right one is "Coves dels Coloms". Thanks. Her first job was at the Natural History Museum of London, not the British Museum!